Homeowners in drought-stricken California are nearly three times as likely to remove their lawn during an outdoor home-improvement job, say results from a survey that examines landscaping and gardening trends. In its 2015 Landscaping & Garden Trends Study, home design and renovation content provider Houzz found that 46 percent of Golden State homeowners who are making or plan to make outdoor upgrades will remove the lawn entirely, compared with 16 percent of all poll respondents. Of those who plan to keep their lawn, 39 percent of Californians said they are reducing its size, compared with 36 percent nationwide. An overwhelming majority of California homeowners – 77 percent – said they were removing or scaling back their lawns to help the environment during the state’s prolonged drought. Another 58 percent seek to reduce yard work, while 56 percent are after a new design motif. Forty-eight percent of Californians said they hope to save money on their water bills, double the U.S. rate. Hardscape was the most popular natural-grass replacement, with 71 percent of the state’s homeowners opting for this material. Mulch was the next favorite option, planned by 55 percent of owners, followed by ground cover (52 percent), flowerbeds (46 percent), and outdoor structures (35 percent). A synthetic lawn was the least-popular reported replacement for natural grass, at 19 percent, although Golden State homeowners are more than twice as likely to take this approach than those in other parts of the country. Other environmentally conscious consumers are taking additional home-improvement steps to help ease water usage. 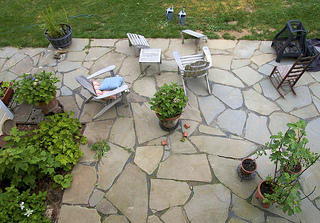 Surprisingly, Houzz says, nearly 1 in 5 U.S. homeowners – 17 percent – is installing a rainwater-harvesting system. The study says that nearly all respondents are making some sort of update to their greenery during outdoor renovation projects, and 42 percent are planning to buy drought-resistant plants, shrubs, and trees. Californians have good reason for concern about the lengthy precipitation shortage; Houzz estimates that 70 percent of the state’s residents are affected by the drought. Their counterparts in Texas have the opposite problem, with 47 percent of homeowners making improvements to impede flooding.